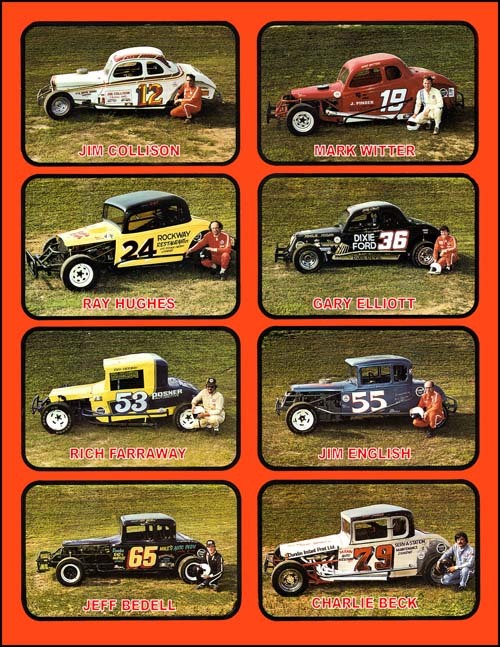 While welcoming in a new year it seemed to be appropriate to reflect back on some of the past Champions of the Canadian Vintage Modifieds. 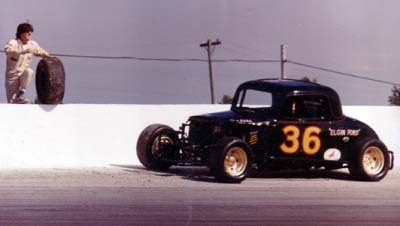 This picture was taken at Flamboro Speedway in 1986. Four of the drivers were Club Champions and three won either a Gold Cup or Flamboro Championship or both. Some were Champions years after this picture was taken. Only one driver did not have the privilege or honour to win a Championship, however his racing prowess was that of a Champion. #12 Jim Collison finished 2nd more than once and missed out on a title before he retired. His best year was 1986. The following is a list of some of these drivers’ accomplishments. #12 Jim Collison….1986 Mid season, End season and Twin 25 Championship races. #55 Jim English…..1983 Gold Cup Point Champion. #84 Rich Farraway…1984 Flamboro, 1984 Gold Cup, 1984 Club Champion. #65 Jeff Bedell…..1989 Flamboro Points Champion. #19 Mike Witter…..1988 Flamboro, 1986 Gold Cup Champion. #79 Charlie Beck….1986 Gold Cup, 1986 Club Champion. #36 Gary Elliott….1989 and 1999 Club Champion. #24 Ray Hughes……1998, 95, 93, 88, 87, 85, 83, 82, Club Champion. 1998, 95, 93, 90, 87, 85, 83, 82, Flamboro Champion. 1998, 95, 93, 92, 87, 85 Gold Cup Champion. Rich Farraway returned to the CVM in 2005 to race with the club after a six year absence. Ray will start his 36th season. He started in 1969, but sat out in 1980 and 1981. Gary joined in 1972 and 2006 will be his 35th consecutive season. 1981 Hobby History Coming Soon! During warm ups one beautiful afternoon in 1981 the right rear axle broke going into turn three. The car did a 360 degree spin stopping about 10″ from the wall. The wheel bounced over landing down by the fence. I know this is hard for most to believe, but I was 34 years old. Did I say 34? Wow. Thirty four is nice…but I learn a lot over next 25 years……..This is one picture of 178 from 1981 soon to be posted in the CVM History section. Oh Canada! 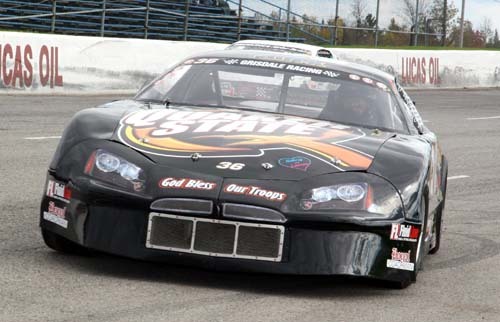 Canadian star, Jesse Pontello to run for the Rookie of the Year title in the ASA Late Model Series Southern Division. 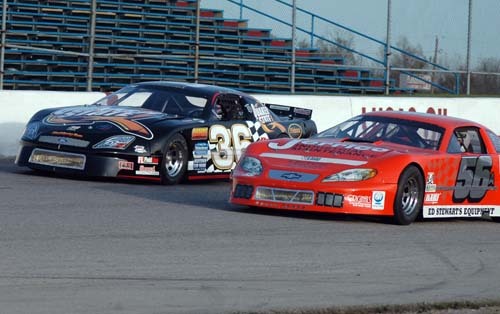 Lexington, Michigan (01/24/2006): Aspiring talents from all over the country are gearing up for the 2006 season with the ASA Late Model Series Presented by GM Performance Parts. Drivers from all corners of the United States are keeping a keen eye on the happenings in and around the ASALMS. Not only does the ASALMS reach all over the country, but our neighbors to the North in the Great White North to be exact, are also keeping up to date everything concerning the ASALMS as well. 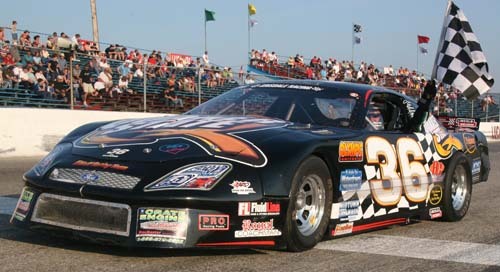 One young, talented driver from the great country of Canada has announced his intentions on running the ASALMS in 2006. 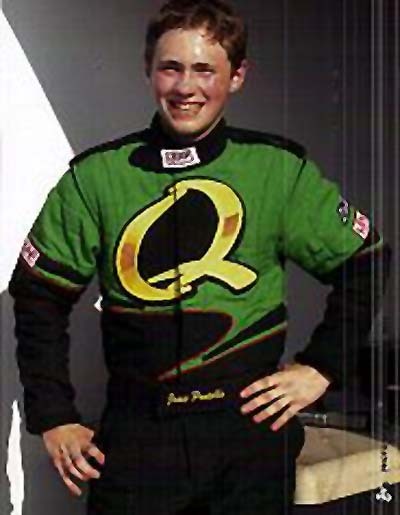 St. Catherines, Ontario driver, 16-year-old, Jesse Pontello has signed on as a development driver for Fridella-Daniels Racing and has announced his intentions on competing for the Rookie of the Year title in the ASALMS Southern Division as well as making select appearances in the televised ASALMS Challenge Division. Gary s Team Prepares For 38th Season! This picture was taken on Saturday February 4th. The picture shows the body panels being held together with temporary fasteners to make sure all parts fit together properly. The car was totally disassembled the following day and sent to Paul House’s shop to have both the frame and body painted. Special thanks to my son David and his crew, Eddie and Marty, as well as Dave Watson, Thatcher Krupp and Big Jim for all their help. The car will be in the Performance World Car Show at the Toronto International Centre in March 10, 11 and 12. Gary will be in attendance to sign autographs and answer your questions. This is a must attend event for all Hot Rod and Race fans. Can you identify the new body make for 2006? Post your answer on our message board. This weekend marks one of the biggest and most prestigious car shows in Canada. Performance World is hosting it’s annual performance custom show with 4 buildings of beautiful Hot Rods, Antiques, Custom cars and high performance race machines. 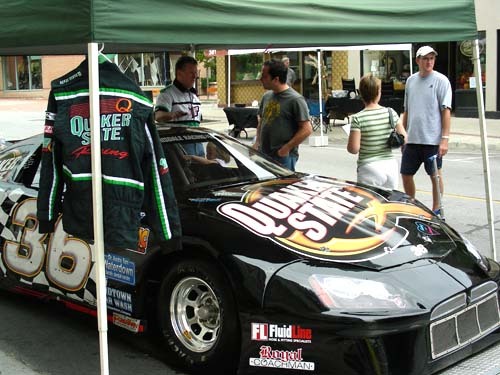 Gary Elliott’s 2006 Quaker State Ford makes its second visit in two years. Gary and his crew will be on hand to talk to fans about this years racing schedule, as well as represent all Elliott Racing Teams valued sponsors. The show starts tonight at 4:pm until 10:pm, Saturday 10: am until 10:pm and Sunday 10:am until 5:pm. Many hours of meticulous work are put into the car prior to the season. Gary, Thatcher And David attempting to solve the engine miss at the track. Gary in 2nd place catching the leader #42 Richard Holmes. 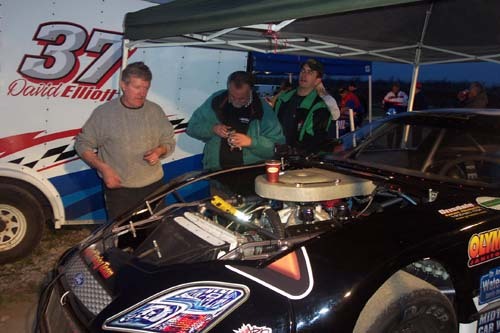 Despite many months and hundreds of man hours of methodical preparation, checking and rechecking every nut, bolt and system on the 2006 Quaker State Ford, Gremlins struck the Elliott Racing Team on Opening Day at Flamboro Speedway. The first practice laps brought smiles of joy to the team as the car turned fast laps and appeared very close on set up. One minor symptom however gave warning of things to come. Just as the practice was ending the engine developed a small miss. The crew immediately went to work making some suspension adjustments and a minor adjustment was made to the carburetion. In the second practice session the car turned even faster lap times and gave indications of being the car to beat. However once again the engine miss appeared. More adjustments were made to the carburetor and the problem appeared to be corrected. Gary started 4th in the 1st Heat. As the green was waved for the first race of the 2006 season Gary quickly showed that the competitive spirit was as strong as every. He quickly moved passed two cars and settled into second place behind Richard Holmes in the #42 car. Gary and Richard rapidly pulled away from the rest of the field. On lap seven Gary started to make a move to the outside to challenge for the lead. All of a sudden the engine cut out and then sputtered on. Gary settled low on the track and nursed the car to a 9th place finish. The crew again went to work trying to diagnose the problem. Fuel lines were checked the engine timing was reset and once again the carburetor was worked on. Again the engine responded in the pits and the problem appeared fixed. Gary started 7th in his second Heat race. Gary drove aggressively on the edge and quickly moved the Quaker State Ford into the top three. Once again the Gremlins struck and the engine started to sputter. Gary dropped to the rear of the field and all of a sudden the engine picked up. Gary again started to move through the traffic and finished in 7th. Although the frustration was beginning to show on the crew Gary pulled the team together and again every possible or suspect area was examined. A new fuel pump was installed and more adjustments were made to the fuel system. The Quaker State Ford started 14th in the Feature Race. As the field drove down the back straight on the opening lap, Gary dove to the inside lane. This was a most fortunate move. As the field entered turn three a collision occurred right at the front. Most of the top ten runners were involved but Gary quickly turned off the track into the infield thus avoiding any damage. The field was reset and Gary started in 6th place. On the restart Gary quickly moved into third place. The car was very quick and Gary began to look below the second place runner as they exited the turns. On lap ten just as Gary exited turn four the engine again sputtered and died. Mark Burbridge in the #27 car was unable to check up in time and bumped the Quaker State Ford in the rear and sent it spinning to the infield. Gary managed to restart the engine and returned to the race a lap down. Gary nursed the Quaker State Ford to a 13th place finish. Although frustrated with being unable to find the Gremlin in the engine the team was able to take heart with the knowledge that the Elliott Racing Team will once again be among the top of the field for the 2006 season. Gary started eleventh and finished third in the 1st Heat. 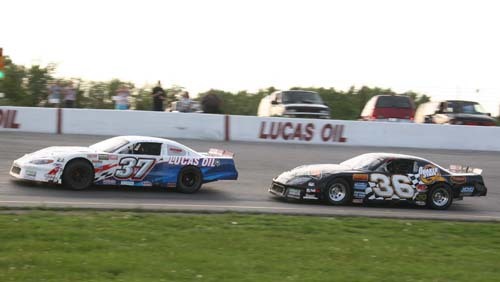 There was a large field of 23 Late Models on hand to do battle at Flamboro Speedway on Saturday night. It was obvious to every one at the track that this was going to be a very competitive night. Having solved the fuel issues from opening day Team Quaker State was looking forward to a better outing the second time around. From the first laps of practice the car was very quick. Gary advised that the handling was a little loose but the engine was running great. The crew made some chassis adjustments and the engine was checked out just to make sure everything was ok.
Gary started very deep in eleventh place for the 1st Heat. At the drop of the green flag the Quaker State Ford leapt forward picking up one position through turns one and two. By lap four Gary was running in seventh place. On lap five Gary moved to the high side of Steve Adams in the 41 car and completed the pass in turns three and four. 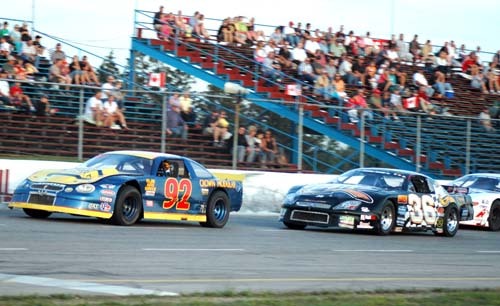 By lap eight Gary was embroiled in a terrific battle with Shawn Arnott in the #3 and Dave Baker in the 50 car. Baker managed to dive below Arnott in turns one and two and Gary followed through the hole. The Quaker State Ford got great bite exiting turn four coming to take the white flag. Gary moved to the outside of Baker entering turn one and completed the pass down the back straight. Gary took the checkered in third place but was gaining on the leader. Gary lined up on the outside pole for his second heat race. Anticipation was high amongst the Quaker State Team. At the drop of the Green flag Gary drove deep into turn one and took the lead. The Quaker State Ford was handling like a dream and Gary hit all his marks in driving a flawless race. At the end of ten laps the checkered flew for Gary’s 1st win of 2006. He was near half a lap ahead of second place and he had lapped two cars. The car was checked over and all was in order for the Feature Race. Gary started the Feature in eight place. On lap two Gary moved outside of Dave Baker to take sixth place. Gary then settled into a terrific duel with son David, Greg Cox and Scott Lyons. On lap ten Gary moved under Cox for fifth place and was headed to the front. The next lap as the Quaker State Ford exited turn two the right rear tire cut down and Gary spun to the infield. Just as Gary moved back onto the track a caution flew. The Quaker State Team changed tires under the caution and Gary returned at the rear of the field but confident that he still was capable of getting back to the front. On lap sixteen with Gary running in eleventh place the Gremlins again worked their mischief as the driveshaft exploded in the Quaker State Ford. The damage was not repairable and Gary was credited with seventeenth place. The Quaker State Ford was very fast in warmups. Gary and the Team prepares for warm-ups. Gary and David running together during warm-ups. Both teams were very equal. Try as they might, neither David nor Gary could pass each other. Gary and Thatcher checking notes and discussing set-up. Team Quaker State Up To Speed. Everything fell into place on Saturday night as the Quaker State Team had their strongest run of this young season. The car worked flawlessly from the opening laps of practice to the final checkered flag. In the first Heat race Gary started sixth. He beat the #5 car of Thane Woodside into turn one to take fifth place. Gary then set his sights on #27 Mark Burbridge. 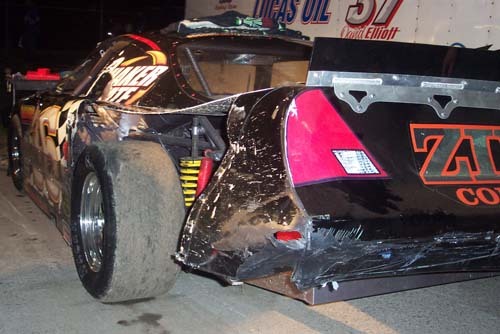 Gary dogged Burbridge’s rear bumper and made several feints to the outside over several laps. The 27 car gradually moved up the track to block the Quaker State Ford. On lap seven Gary again looked outside entering the corner. Burbridge moved up the track and Gary pounced. He muscled the #36 low and stood on the throttle exiting turn four, slipping under the #27 and grabbing thirds place. Gary closed in on the leaders over the final two laps and took the checkered in third place. Some minor adjustments were made to the chassis and Gary was sent out in fifth place for his second Heat. Gary quickly moved the Quaker State Ford past two cars in the first couple of laps. On lap six he moved outside of #3 Shawn Arnott and took 2nd place. Gary then settled into a steady rhythm and caught up to the rear bumper of the leader as the checkered flew. Buoyed by a 3rd and 2nd place finish in the Heats the Quaker State Team made a methodical check of the car in preparation for the Feature. Gary started sixth in the Feature with all the top dogs lined up in front of him. At the start of the Feature Gary quickly settled in behind, 2005 Champion, #52 Scott Lyons. The front pack of seven cars ran nose to tail with barely room to slip a hair between their bumpers. At the midway point #89 Shawn Chenoweth slipped up the track in the turn and Lyons drove below. Gary followed Lyons through the hole and took 5th place. 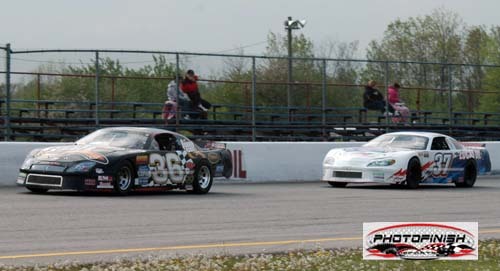 Jeff Stewart in the #56 car then became embroiled in a side by side battle with #37 David Elliott for first place. As they entered turn one they came upon a lapped car causing a three wide incident resulting in Stewart hitting the wall. As a result Gary moved his Ford into fourth place. Try as he might Gary was unable to make a move on the #52. 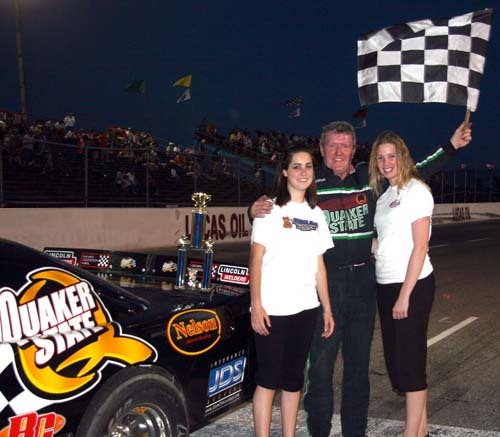 Son David Elliott took the checkered first to win his first Feature of 2006. Gary crossed the line in fourth place. The Quaker State Team was very satisfied with the results and is now prepared to be a driven force in the run for the Flamboro and W.W.S. Championships. Cold Night and Fast Field = CHOO CHOO! Perhaps we are paying now for the mild winter we had. It sure seemed that way on Saturday night as temperatures dropped. The cold night, though tough on the crew and spectators had the opposite effect on the car and driver. Racers enjoyed the warmth in their race cars and the engines produced some very good horse power from the cool night. After a good run last week, the focus was on the points chase. In the first heat, starting 6th Gary battled for half the heat race with Chris Bochsler #75 until a caution flag came out. On the restart Paul Howse #8 was able to get by both Gary and Chris. At the checker the Quaker State team crossed the line in 5th place. In the 2nd heat Gary started 4th. Once again he would battle with Paul Howse, only this time the results would be different. The top three cars ran side by side for the first part of the heat with Gary taking 2nd and Paul finishing 3rd. Mark Burbridge #27 won that heat. The feature inversion was 3. Gary started 6th of twenty one cars. Though a fairly good starting spot, the quality of competition both in front and behind were the very best. On the green flag most drivers on the outside lane were looking to get to the inside. The reason was simple. On a cold night, the outside lane has less traction. Running low is where you need to be. If you’re on the outside you have to go further just to keep up, let alone pass. Poor traction means a driver needs more time to get on the gas, by then the inside cars are gone. The term used to describe this event is being “freight-trained”, when all the cars line up bumper to bumper and make it impossible for the outside car to get in. That’s what happened to the Quaker State Ford. By the time Gary got in line on the bottom groove he found himself in 11th spot, not quite the caboose, but a long ways from 6th. The cars ran tight but in single file. Coming off turn two on lap thirteen, three cars directly in front of Gary made contact. The melee sent cars flying. Gary was able to get around the spinning cars. On the restart a quick pass put the #36 in 7th spot. Mark Burbridge was in 5th on the outside lane. Like wolves the pack lined up on the inside to pass Mark. He knew what was about to happen. Some drivers know they’re going back and run their hardest, others try forcing their way down and sometimes it works because the car in the low lane backs off. But most times it causes a wreck and when Mark came down he hit the 6th place car causing both to spin out. Once again Gary was able to get around the spinning cars. The rest of the race ran clean and after the dust settled Gary had claimed 6th place. 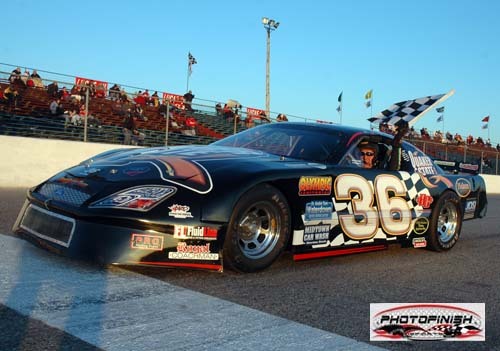 This night helped in the points race ….on May 27th Gary and his team will have their car in Georgetown at the Alliance Church for a family day. Saturday night will be regular Flamboro racing at 6:30 pm. On Wednesday May 24 Gary was a guest speaker at the Yorkland Christian High School graduation banquet. Approximately one hundred students, teachers and parents were on hand to hear Gary share his faith and passion for racing. Gary congratulated those who would win awards and encouraged those who did not win this year to remember to enjoy their sport, never give up and always try to do their very best every time. On Saturday morning it was off to Georgetown Alliance Church for support in a fund raiser for children in Mexico. Part of the event was that people could swing a sledge hammer and smash it into cars. Gary explained to the participants that the Quaker State Ford was not part of that event. Little did Gary know that by the time Saturday night was over the Black #36 would look like it had been smashed repeatedly with sledge hammers. The Quaker State crew will be extremly busy repairing damage and again attempting to find the “miss” problem. Trying to get rid of the engine miss that has plagued the team since the second day of racing finally resulted in one of the worst wrecks in Gary’s short Late Model career. The engine miss caused by (at this time) an unknown source would occur during a caution after thirteen or more laps of hard racing. It would clear up before the race restarted but this past Saturday that wasn’t the case. After strong runs in both the heats, a second and third, Gary was ready to battle the top guns in the feature. In both of those races there were no signs of any engine or electrical problems. The inversion draw wasn’t kind and resulted in Gary starting from 8th place. It would be a struggle to move forward with seven fast cars ahead. Gary slipped back in the early going but moved back up to 7th by lap six. A battle for 5th was heating up with David and Shane Gowan #10. Exiting turn two the car following the Quaker State Ford rammed Gary in the rear bumper sending the black Ford flying through the infield. A caution came out as many of the cars behind were spinning to avoid each other. Gary restarted at the tail end of the field. It would be a long way back to the front. That’s when the engine started missing again, only this time on the straightaway and with very serious consequences. When the engine quit on the Quaker State Ford a competitor struck the car in the left rear corner, turning Gary sideways. The car then continued into the left rear fender ripping it off and launched up and over the back wheel of the immaculate #36. The cars right front wheel struck the window net area. Fortunately the safety net did its job and it kept Gary safe. When the dust settled three cars were in the wall and Gary was sitting in the infield with a badly damaged race car. He proceeded to the pits and the crew quickly replaced a mangled wheel and broken shock. Gary returned to the race surface to finish 16th. The Quaker State team not only has to find the miss, but fix the extensive damage to the body and chassis…no problem, they’re not new to this. 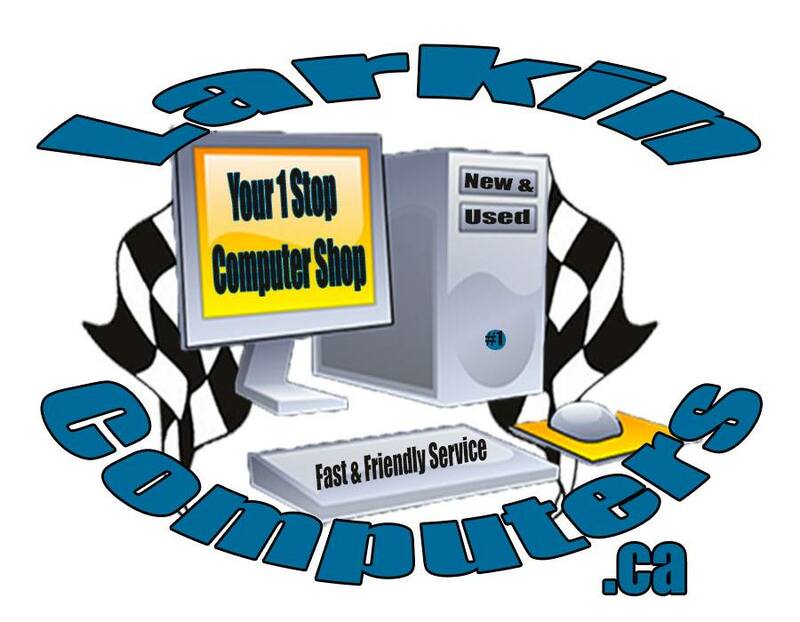 There is no racing, at Flamboro, for Late Models on the June 3rd weekend. The crew can take their time repairing the car. They plan to have the car ready this Saturday for practice to get set up for the first Grisdale Triple Crown race Saturday June 10th. Races that night start at 6:00 pm. Indications are that Late Model Teams from the ALLSTAR Series and Delaware and Kawartha speedways will be coming to compete in this event. This is one event you should not miss. The action will be fast and furious. Dale Jarrett called Gary and asked him to come down to Homestead Speedway in Florida and test his race car. Gary accepted and is currently at the track testing. Well ok that’s not exactly the truth. Gary won a trip to Dale Jarrett’s RACING ADVENTURE through Ford. 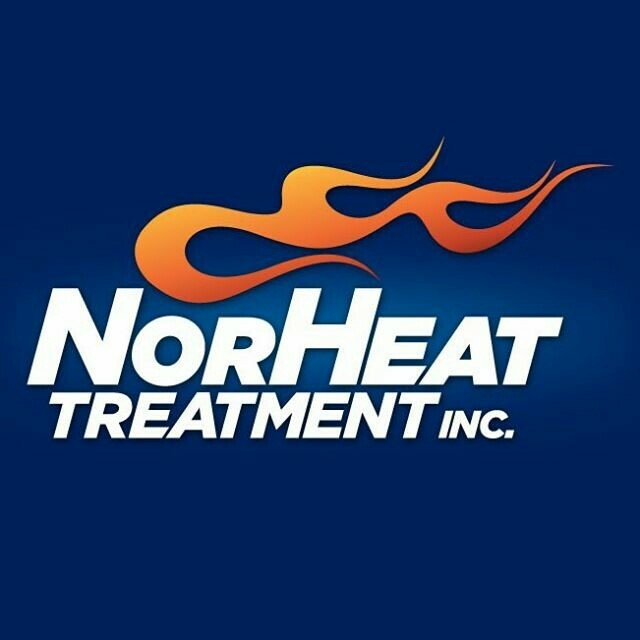 He is presently in Homestead Florida enjoying the experience which includes driving a Nextel Cup car at Homestead Speedway. Gary will return in time for this weekends Grisdale Triple Crown event at Flamboro Speedway. To say that the 2006 season has been a disappointment to the Gary Elliott racing team would be an understatement. The team entered the season hoping to challenge for the Flamboro Championship. Some equipment failure and mistakes early appear to have moved the team out of contention for the championship. For the past two weeks the team had rededicated it self and spent many hours of hard work in an attempt to turn things around. 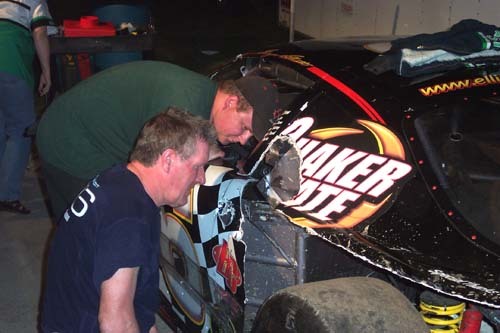 The team repaired the extensive body damage to the Quaker State Ford. The entire electrical system was then rewired with the very kind assistance from Bill Lyons and Bill Podd. 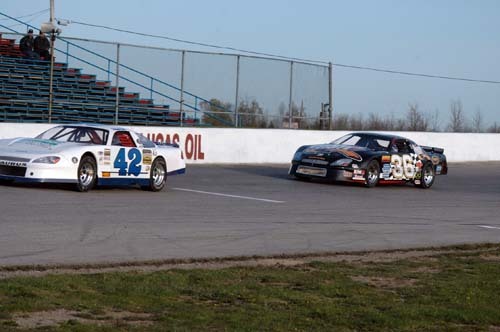 The car was then taken to Flamboro Speedway for a test season and numerous laps were run. Everything checked out ok and to the relief of everyone the electrical problems, that have plagued the team all year, appeared to be fixed. The car was then taken back to the shop, the chassis was scaled, set and a final nut and bolt check was completed. 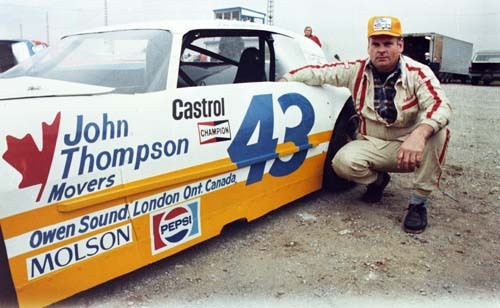 The car was ready for the first Grisdale Triple Crown Event at Flamboro Speedway. Gary was home from his experience with the Dale Jarrett Driving Adventure at Homestead Speedway and seemed well rested and reinvigorated. In the first set of warm-ups the car appeared close on setup and turned some very fast times. After consulting with Thatcher it was felt that only a minor chassis change was needed. In the second warm-ups the car was rock solid and very fast. Gary returned to the pits and declared that the car was ready to race. Thirty Late Models arrived at Flamboro on Saturday ready to do battle for the Grisdale Triple Crown. The qualifying format was set as three Heat races with the top six finishers from each qualifying and then a last chance Consi with the top six finishers qualifying. Starting positions for the Heats were set by drawing. Lady luck did Team Quaker State no good when Gary drew to start ninth in the first Heat. Neither Gary nor the team was in the least concerned as they knew they had a car and driver capable of marking it to the top six. When the green flag waved at the start of the Heat Gary stayed in the low groove as this is usually the fast way around Flamboro. The problem was everybody else held the same opinion and also stayed low. Gary quickly made the decision that he had to try the high side as the Heat was just too short to sit back and wait for something to happen. Once in the outside lane Gary slowly started to pick off one competitor at a time. A short caution occurred but luckily Gary restarted in the outside lane. When the green flew he continued to move forward and eventually wound up finishing fourth. Gary returned to the pits happy with having qualified and thrilled with the way the car was handling. At the end of the Heat races Gary held tenth place in the qualifying order. A complete nut and bolt check was done and no adjustments were made to the car. The inversion number drawn by a fan inverted the top eleven competitors. Gary would start the fifty lap Feature on the outside of the front row. The cars all lined up on the front straight and driver introductions were made. Anticipation mounted as the drivers buckled in. This was surely the strongest field of Late Models seen at Flamboro Speedway in many years. 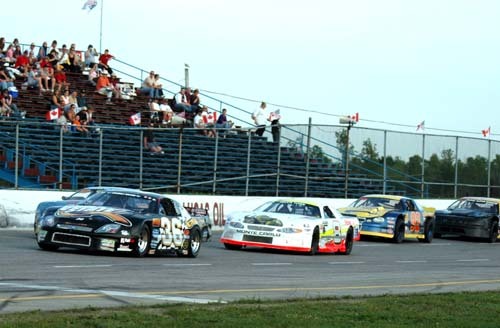 Besides all the Flamboro Regulars there were top teams from both Delaware and Kawartha Speedways and several drivers from the ALSTAR series. At the drop of the green flag Gary drove hard into turn one and held his position outside of pole sitter #70 Jeff Hanley. As the field exited turn two Gary moved to the inside lane and settled in behind Hanley. #6 Cole Pearn from Delaware Speedway followed through in third. Hanley set a blistering pace with Gary and Pearn in close pursuit. Several times Pearn attempted to drive below Gary through the middle of the corners but could not make a pass as Gary was able to accelerate much better off the corners. 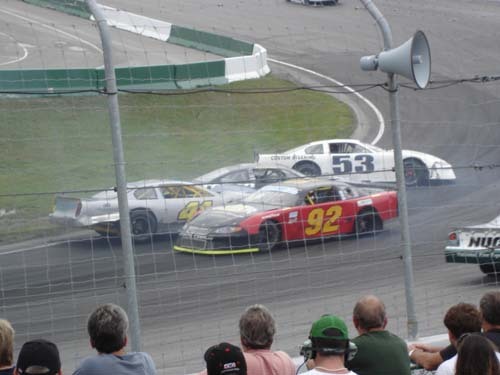 For twenty laps the cars ran nose to tail with no space between their bumpers. Hanley’s brake began to glow as he was working them hard in the corners. Hanley then began to push up ever so slightly in the corners and the Quaker State Team began to believe that if the race stayed caution free Gary might be able to slip under the #70 and take the lead. This was not to happen though as a spin resulted in a caution around lap twenty four. Hanley had time to cool his tires and brakes down. When the green flag waived the front trio again moved off to their own battle. By lap twenty eight Hanley again started to show a push. On lap twenty nine it was a little worse. On lap thirty Gary decided to stay as low as he could on the track and if Hanley pushed up he would try a pass. As the cars entered turn one Hanley started to push up. In the center of the turn the Hanley wiggled as he tried to get on the throttle and had to lift. Gary also had to lift to avoid hitting Hanley. Pearn following behind Gary did not check up and struck the rear of the Quaker State Ford sending it spinning to the infield. A caution resulted and Pearn was penalized for rough driving. Gary and Pearn restarted the race at the rear of the field. When the race was restarted Gary quickly began to pick off competitors and it was hoped that he might crack the top ten before the race ended. On lap thirty four the Quaker State Ford lost all power and electronics exiting turn four and their race was over. The collision with the #6 car had been so severe that it had broken the battery box. The battery subsequently fell out of the car killing all power. Upon being towed to the pits Gary consoled his crew and informed them that we were the car to beat tonight and that everyone had done a superb job. Gary has advised team members that these are test of our strength and how we come out the other end is how we become better people. The team knows that although we had an unlucky night we are now doing the things that are needed to put us in victory lane and with Gary’s leadership it is not a question of if but only when. To say that the 2006 season has been a struggle for Gary Elliott and his team would be an understatement of gigantic proportions. They have run the gambit of mechanical problems, electrical problems, carburetion problems, flat tires, radio problems and wrecks. Through all of this Gary has never allowed the Team to lose focus or become dispirited. Gary has made sure that going to the track has been a fun experience no matter what the outcome. 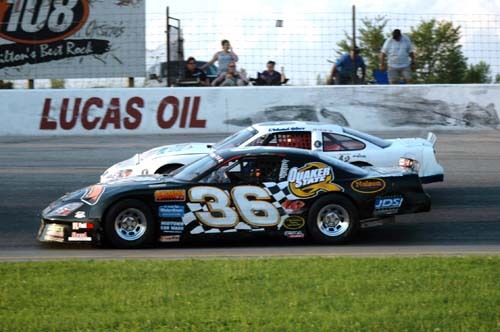 Saturday night at Flamboro Speedway started on a high note with a dominating Heat win. The Team was then knocked to the low point of the season when the Gremlins struck again. Gary pulled onto the track for his second Heat race. All of a sudden the engine began to cough and would not run. Gary missed his second Heat! Once again the Gremlins had done their work. A piece of dirt had fouled the carburetor. Even this was too much for Gary and for a few moments despair settled over the Team. Gary and Thatcher began to take the carburetor apart and Jason pulled the fuel filter out. Then the Flamboro racing fraternity displayed its best side. People from other teams began to arrive and offer their help. Jr. Hanley from the #8 team jumped in and helped with repairing the carburetor. Bill Lyons from the #52 team showed up and assisted and offered parts for the carburetor. Many other team representatives arrived and offered assistance and moral support. The Team Quaker State pit became a beehive of activity and it was impossible not to catch the spirit off the moment. Then the big turn around happened. Due to his not running the second heat race Gary was tenth in the qualifying order for the Feature. A fan then drew the #10 for the inversion order flipping the top ten cars and putting the Quaker State Ford on the pole. A quick final check of the car was made and a final chassis adjustment completed. As Gary climbed into the car Thatcher told him not to worry about the other cars, to drive his line where the car worked best and in the end he would win. As Gary lead the field to the green flag he drove deeper into turn one than outside pole starter #50 Dave Baker and the Quaker State Ford took the lead. Exiting turn two and down the back straight #42 Richard Holmes and #82 Jason Shaw followed Gary under Dave Baker and the trio set off in a three car chain at a blistering pace. 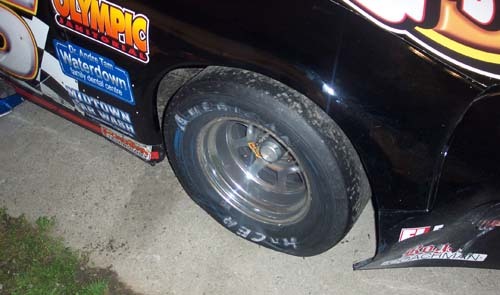 On lap four Holmes’ right front tire developed a leak and he pushed up in turns three and four. Shaw jumped on the opportunity and drove below Holmes taking 2nd place. Meanwhile Gary continued his blistering pace and began to inch away ever so slightly. By the mid race point #8 Paul Howse had moved through the field and settled on Shaw’s bumper into 3rd place. At this point the Quaker State Ford developed a push. Shaw and Howse hooked up and slowly began to reel Gary in. By lap nineteen they had closed to the bumper of the Quaker State Ford and the fans sensed a thrilling finish in the making. Gary began to dial more rear brake into his car in an attempt to loosen it up. On lap twenty the Quaker State Ford pushed up ever so slightly entering turn three. That was all the invitation Shaw required and he pounced. The 82 car drove low and pulled along side the left rear fender of the Quaker State Ford in the middle of the corner. Sensing that this was the defining moment Gary held his breath and mashed the throttle exiting turn four. The Quaker State Ford leapt forward and rocketed off the corner. Shaw could not get on the throttle as fast and had to settle back into 2nd place. For the next four laps Shaw would look low in every corner but he was not able to make the move. As Gary took the white flag on lap twenty four it became apparent that one more obstacle was to be over come before the end. The leaders were catching slower traffic. As Gary entered turn three he came upon a lapped car. Gary swung the Quaker State Ford to the outside of the lapped car. Shaw stayed low and started to pull along side Gary. Shaw was hoping that the lapped car would move up the track and leave him an opening. The lapped car held his line and Gary accelerated by on the outside and took the checkered flag for a long awaited Feature win. 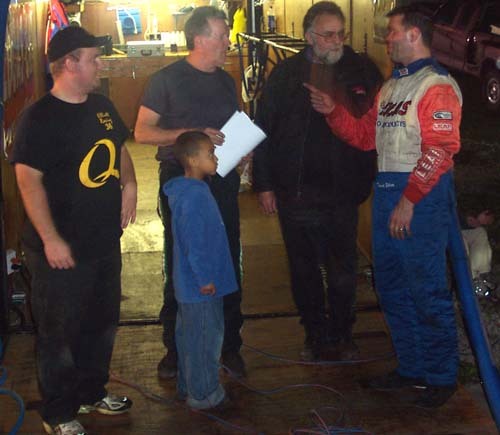 Following the win Gary said …”beating Jason Shaw was as great an achievement as winning the Feature. I think Jason is one of the best Late Model drivers in Ontario and he has always had my utmost respect as an aggressive but clean driver”. The celebration in the Quaker State pits was not the wild scene that some would have expected. The mood was joyous but subdued as the Team members reflected on the trial and tribulations leading to this point of the season. Gary’s mother is visiting from Nova Scotia and was at the track to witness the win. She stated …”Gary has loved racing since he was 5 years old, he always wanted to race.”…”I was watching my son who’s almost 60 years old racing like he’s 30″…..
What a thrill for both mother and son! Autograph Day at Flamboro Speedway is always a special day for Gary as he loves to interact with race fans especialy the youngest one. Gary autographed many Hero cards on Saturday but still had enough strenght left to muscle the Quaker State Ford to another day of strong finishes. In Heat action Gary jumped out to a good lead in the second Heat and then cruised to the checkered flag for another win. In the fourth Heat Gary was in much tougher company and had to start deep in the field. Gary drove a determined and smooth race to finish in fifth place. In the Feature Gary started seventh inside of son David. Father and son battled side by side and gave the fans a thrill, with Gary finally getting the edge and passing David. Gary then turned his attention to the cars in front of him and made a couple of slick moves to bring the Quaker State Ford home in fourth place. Jessie Pontello celebrated Canada Day by winning a Heat race in Gary’s CVM car. Canada Day reminded Gary what it had been like to drive the Quaker State car in 2005 with no power steering. In first Heat action the Quaker State car went off roading into the infield and colided with some curbing. Gary nursed the car home to an eight place finish. The suspension was checked over, a wheel and tire replaced and the toe was set. Gary returned to the track for his second Heat race and he imediately knew something was wrong as the car was very difficult to steer. 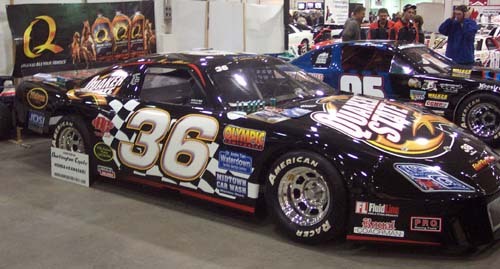 Gary carefuly drove the car home to a seventh place finish. Once again the crew gave the steering components a check and this time found that a part on the power steering had broke. The piece was repaired as good as was possible at the track. Gary started fourteenth in the Feature and began to move quickly towards the front until the repaired part again broke under the stress. With the power steering out of service Gary had to call on every ounce of his strenght to muscle the car around the track. He did a remarkable job under the circumstances and drove the car across the finish line in seventh place. During the week Gary’s team gave the car a good going over and again repaired the broken power steering part as a replacement could not be obtained in time. The team arrived at the track hopeful that the part would stand up to the fifty laps. Twenty eight cars showed up to attempt qualification for the race. Gary started fifth in his Heat race and drove to a very strong second place finish. The inversion left Gary starting tenth in the Feature. Although confident in the car and driver the Quaker State Team was worried about the repaired part. Time would show that it was with good reason. Once again the part failed under the extreme stress that it needed to endure. Gary did the best job he could in bringing the car home in 12th place. Team Quaker State arrived at the track with a new part in the power steering and full of anticipation for the evening’s events. Gary started seventh in his first Heat and was immediately boxed in behind slower traffic so he had to settle for sixth place. Some adjustments were made to the chassis and Gary lined up outside David on the front row for their second Heat. At the drop of the green Gary kept his foot in on the power and drove deeper into turn one than David. The chassis adjustments worked and the car stuck. Gary got a good run out of turn two but David beat him out of the corner and took the lead. Gary settled in behind David and waited for the right moment to pounce. With two laps to go David pushed up entering turn three and Gary drove under him to take the lead. Gary pulled away on the final lap and cross the finish line for the win. There was no inversion for the Feature so Gary lined up in the fifth starting position with all the top guns in front of him. By Feature time the track was very slick and the prospects did not seem good for side by side racing. When the green flag waived the top five fell into single file and ran the entire distance nose to tail. Gary crossed the finish in fifth place. David won the Mid Season Championship, his first in a Late Model. When Gary won the Feature race on June 17 it automatically locked him into the fifth starting position for the Ron Williams Memorial 100. A with the previous week the track was very hot and slick and the prospects of moving up in the field were few as all the top guns were starting up front. When the green flag flew the field immediately settled into single file and began the long run to the end. Every driver attempted to look high or low but few opportunities to advance presented themselves. A caution was waived for a spin and Gary had to restart beside Jason Shaw. They ran side by side for a lap but Gary just could not get the necessary traction and Shaw took the position. Gary settled in behind and completed the race in sixth place. Team Quaker State made the trek down to London on Friday to compete in the Twin 75 lap events. All the Delaware teams were present as well as a lot of the other top teams in Ontario so the competition promised to be extremely tough. Having run at Delaware in 2005 without much success, the Team made notable changes to the setup. Those changes made the difference. The car was faster and far more stable for Gary to drive. For the first time ever Gary had to time trial a Late Model for his starting position. Prior to climbing in the car Gary was like a child in a candy store. He did not know what to think about his chances but was just thrilled to have the opportunity to make the run. The Quaker State Ford was about the tenth car to attempt qualifying. Gary pulled onto the track gunned his motor and set about the task at hand. Into turn one perfectly on his marks ….rocketing off turn two out towards the wall ….down the back straight and hold the throttle open as long as he dared ….on the brakes and turn down into turn three ….on the gas again and accelerate full out of turn four hoping the tires will stick ….drift out towards the wall and will his car across the finish line ….19.211 seconds ….third fastest at the time and good enough for tenth fastest at the conclusion of all time trials. Not bad for his first time. To say that Gary and the team were thrilled is an understatement. When the green flag waived to start the first 75 lap Feature Gary quickly moved the Quaker State Ford through traffic and into sixth place. On lap four as he was in the middle of turns one and two another car struck the Quaker State Ford from behind and sent Gary spinning to the infield. A caution waived, Gary returned to the race track and restarted at the rear of the field. When racing resumed Gary took the high lane that few other drivers were willing to try. Gary once again moved quickly through the field and in short order found himself running up front again. As Gary entered turn one another car again hit him from behind but with much more dire consequences. Gary was unable to hold the car down in the spin and as it shot back up the track several cars made contact the worst of which was from David spinning backwards into the right front of the Quaker State Ford. The damage to both vehicles was extensive. David managed to return to the race to finish in the top ten. Gary however was out of the race and finished 27th. The damage was once again to the power steering unit and rack. The team worked hard and got the car ready to roll just in time for the second race. Once on the track Gary radioed that the steering was still not right. Gary held onto and finished 16th. Gary returns to the track after being spun in turn two. Jr. Hanley and Thatcher work on setting up the Quaker State Ford. A Shake Up In The Championship Hunt! Sometimes bad luck truly does have a silver lining. Gary pulled into the Flamboro pits on Saturday sitting in 5th place in the Flamboro Championship hunt. The focus was on chipping away at Simon Wild’s 4th place lead. The top three positions (Scott Lyons, David Elliott and Paul Howse) were out of reach. Or were they? In Heat race action Gary finished 3rd and 2nd, putting him 5th on the starting grid for the Feature. At the start of the Feature Gary settled in behind Scott Lyons and was waiting for an opening when Scott made contact with Simon Wild causing Simon to spin in turn three. With great skill Gary locked up the brakes on the Quaker State Ford and threw it into a sideways slide to avoid hitting Simon or the wall. Other cars following also spun and the caution was waived. The black flag was waived at Lyons for rough driving and he was subsequently penalized all Feature points for the night. All of a sudden 3rd place in the Championship hunt was now within reach. Gary restarted the race in 17th. Gary tightened his seat belts and got up on the wheel. In the remaining laps Gary picked his way back through the field to eventually finish 7th. Gary’s Quaker State team pulled into the track on Saturday night fully prepared and confident of a good run in the making. In Heat action Gary had very solid runs and finished in 2nd place in both races, putting him on the outside pole for the Feature. The cars were lined up, circled the track to warm up the tires and then took the white flag for one lap to go to start the race. 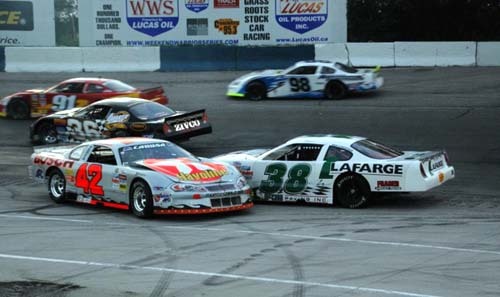 The field entered turn three and the pole sitter (# 52 Scott Lyons) began to accelerate. Gary kept pace and was looking forward to a good jump so that he could race Scott for the lead into turn one. As the field exited turn four and prior to the green being waived # 8 Paul Howse hit the Quaker State Ford from behind, turning the car sideways across the track right into the path of all the oncoming cars. 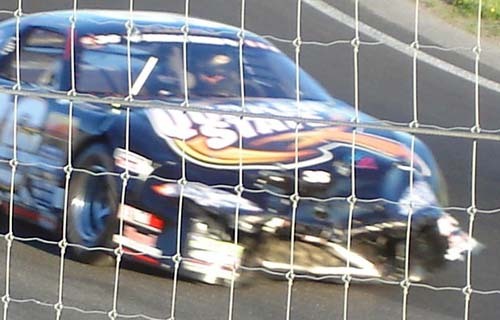 # 56 Jeff Stewart hit the Quaker State Ford hard in the left front corner causing considerable damage to both vehicles. The rest of the field piled up behind and few escaped without damage. Gary brought his car to the pits and the crew quickly changed the left front wheel and assessed the damage. The car was safe to return to the track but it obviously would be a handful for Gary to drive. Howse who was 2nd in the Championship hunt was shown the black flag and disqualified for rough driving. When racing resumed Gary restarted at the rear of the field. It was obvious that the damaged Quaker state Ford could not compete with the leaders but Gary gave it his all and in the end he finished in 4th place. A remarkable achievement indeed. 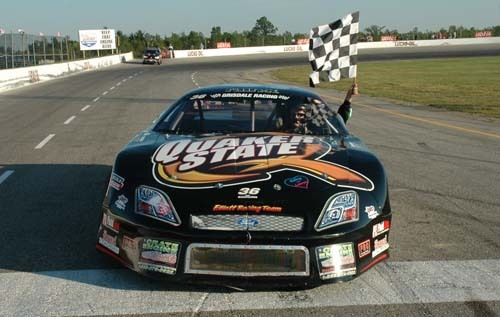 No matter how bad things were Team Quaker State did not have as rough of an evening as the #15 Team Super Late Model. The heavy damage seen in the picture was mostly cosmetic and was repaired prior to the Feature. This picture was taken moments after the collision between Gary and # 75 Jim Sweers. 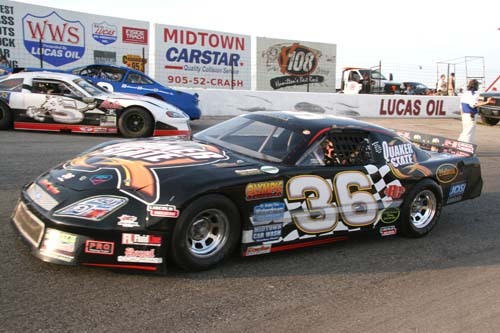 Gary and his team made the trek to Kawartha Speedway on Friday night. The plan was to get some track time in and get a base line set up for the big event at Kawartha in September. The weather was perfect, the pits were packed with cars from all divisions and the fans were out in record numbers. All seemed well. In warm-ups Gary felt that the car was a little loose so only a minor adjustment was made. In the Heat race Gary discovered that the car was a lot looser than expected so he dropped to the rear of the field to feel the chassis out……well almost to the rear. Fellow Flamboro driver Jim Sweers was also at Kawartha and in the same Heat. Jim was experiencing problems himself and also dropped to the rear of the field and was running about ten car lengths behind Gary. As Gary entered turn one the rear end came around and the Quaker State Ford turned sideways across the track. Sweers attempted to steer around but at that moment his steering box broke and he slid into the front of the Quaker State Ford. The damage to both cars was enough to knock them out of the race. Once in the pits it was determined that the damage was mostly cosmetic so the crew set about repairing the damage. Some more chassis adjustments were also made and the work was completed in time for the Feature. Gary started 22nd in the Feature and took the opening laps to feel out the car. The adjustments helped but the car was still loose. Once he was sure of the handling Gary began to move through the field. One by one Gary picked off the opposition and by race end he had moved into 11th place. All things considered a pretty satisfying effort. The Quaker State Team arrived back in Waterdown at 2:30 am. after racing at Kawartha. 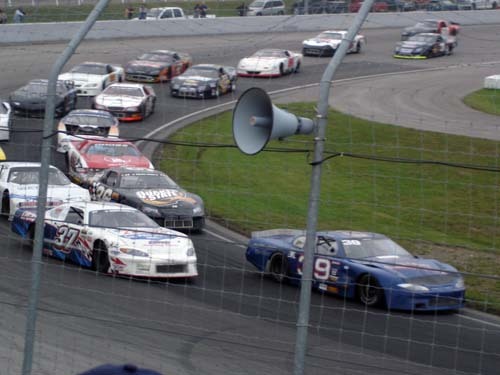 It was agreed that the Team would meet at Flamboro Speedway at 2:00 pm. and everyone went home to get some much needed sleep. Once at the track the Quaker State Ford was taken through pre race tech. and then the team went to work changing gears and making further repairs to the damaged nose. Several top teams from other tracks showed up to compete against the Flamboro Speedway regulars. The Heat races were very competitive and Gary did a superb job of qualifying finishing 3rd and 4th. This was good enough to nail down the 3rd place starting position for the Feature. At the start of the Feature Gary settled into 5th place and was getting ready for the long run. Around lap eleven Gary could feel that the motor in the Quaker state Ford was a little flat. On lap fourteen Dave Baker in the # 50 car hit the wall very hard in turn two and was injured. The race was red flagged while the safety crews extracted Baker from his car and he was taken to the hospital by ambulance. Dave was examined at the hospital and some tests were run. He had suffered a concussion and was very sore but otherwise he was ok. The temperature dropped about seven degrees while the race was red flagged and when the race was resumed Gary radioed that the engine had picked back up. The reprieve was only temporary as the engine again began to loose power when it heated up. Gary held on as best he could but then the car began to push in the corners. There was nothing left to do but hold on and ride it out to the end. By the time the checkered flag waved Gary had slipped to 9th place. Not too bad all things considered. The Team will definitely have a lot of work to do this week. 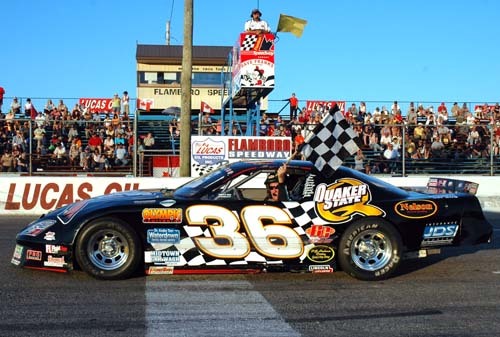 This Saturday night is the Don Biederman Memorial Race at Flamboro Speedway. It is also Soap Box Derby Night. 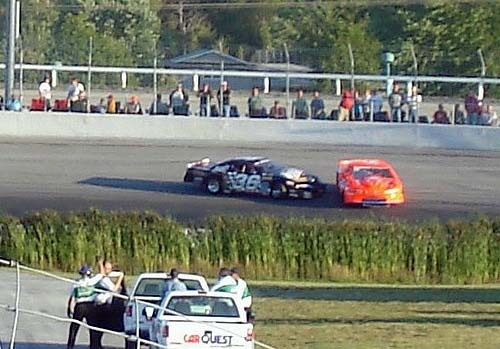 The race card consists of Late Models, Thunder Cars, Mini Stocks and Can-Am Midgets. Pits open at 2:00pm Grandstand opens at 4:00 pm. Soap Box Derby at 5:00 pm. Racing Starts at 6:30 pm. 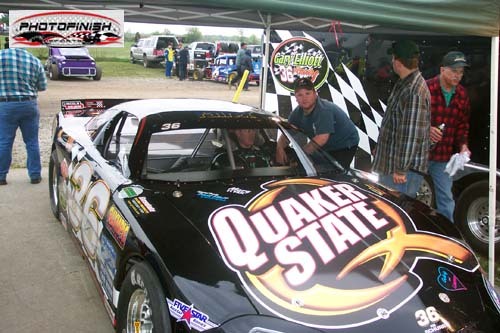 Gary and the Quaker State Team are primed and ready to race in this prestigious event. 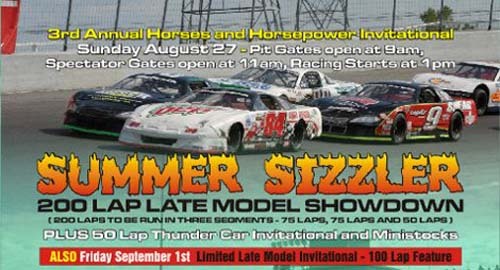 On Sunday August 27, 2006 Kawartha Speedway will be holding their Late Model Summer Sizzler 200. 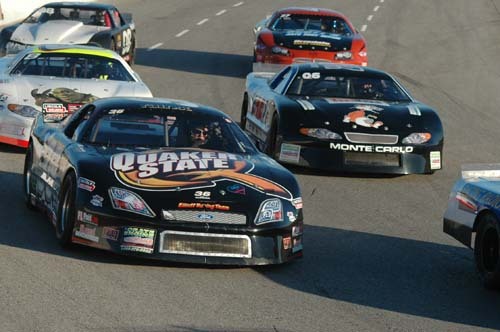 A large field of Late Models from across Ontario and the northern U.S. is expected. This promises to be one of the best Late Model shows in years. Plan to attend. Gary and the Quaker State Team will be there to compete. Gary is hoping for a really good run this time around at Kawartha. The Quaker State car is seen here at speed during practice. Note the new front end. Eddie welding the rear end. Team Quaker State arrived at the track on Saturday night with a new front end on the car, new springs, new shocks, a completely new set up and a new engine. Yup I said engine! During the two week layoff it was discovered that the old engine had one broken and two cracked pistons. Repairing the old engine did not seem to be the sensible way to go so a brand new power plant was purchased. With extensive help from David Elliott and Eddie Askins the engine was replaced just in time for racing last Saturday but unfortunately the night was rained out. The car was very fast in warm-ups and only some minor tinkering was done prior to the Heat races. Gary was slated to start third in the second Heat and was warming up the tires on the track when suddenly the left rear control arm bracket broke. The car was brought to the pits and repairs began. Although Gary missed his Heat race it was lucky that the part broke under less than race speed minimizing the damage. Gary started sixth in the fourth Heat and drove a superb race weaving his way to the front. He caught race leader Dave Baker with two laps to go and they waged a battle that brought the fans to their feet. Gary got under Baker exiting turn four and they ran side by side to the finish with Baker taking the win by less than six inches. Due to his failure to start his first Heat race Gary was regulated to a twelfth place starting position for the Feature. When the green flag waived Gary began his climb towards the front. Lap after lap he passed competitors high or low. 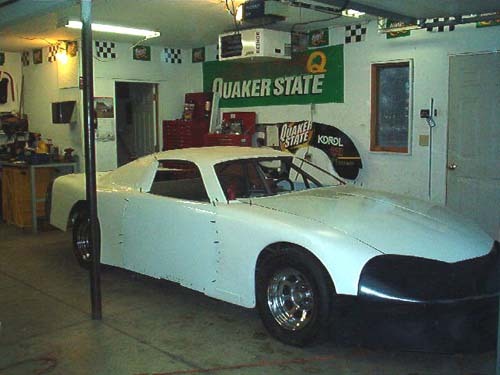 It didn’t matter where as the Quaker State car was really hooked up and Gary was hungry for success. By lap seventeen Gary had moved into fifth position. The top four cars had hooked up in a group at the start of the race and steadily pulled way from the rest of the field. Once Gary broke free of the slower cars he began to run down the lead group. He was narrowing the gap on every lap but unfortunately ran out of time when the race ended. Gary and the crew were very pleased with the fifth place finish given how deep he had started in the Feature. 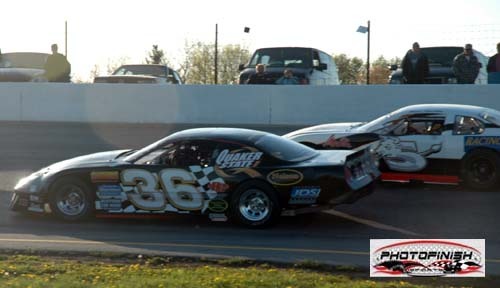 A quick gear change was made and the car was loaded into the trailer ready to head to Kawartha Speedway early the next morning for the Summer Sizzler 200. Flamboro driver #41 Steve Adams was involved in this wild turn four wreck. Steve was able to continue but his front end was beat up. Too Tight. Out of Gas. Too Loose! Too Hot! Following Saturday night’s racing at Flamboro the Quaker State team headed home for a few hours sleep. The alarms awoke the crew at six am. and the trip to Kawartha Speedway was made. Upon arrival it was obvious that it had rained quite hard at Kawartha during the night as the pit area was soaked. Later in the day when the temperature rose the pit area became a sauna. The car was unloaded passed through pre tech. inspection and regular maintenance was preformed. During warm ups the car was loose so adjustments were made to the chassis. In Heat action Gary started sixth. When the green was waived Gary made some good moves on the high groove and passed a couple of cars. The car was still too loose and as a result Gary could not make the car run in the low groove. One car got under the Quaker State car prior to the finish and Gary settled for fifth place. More adjustments were made to the set up and Gary started the first 75 lap race in 15th place. Right from the start it was obvious that the adjustments were too much as Gary reported that the car was tight. He fell to the back of the field waited for a caution and then entered the pits for adjustments. Unfortunately the adjustments took longer than was hoped and Gary went a lap down. When racing resumed Gary reported that the car was much better and he began to pass other competitors. When the checkered flag fell Gary was running in the top twenty. Gary started third in the second 75 lap race and stayed in the top five for the first few laps. Suddenly the car lost power. The car was pushed to the pits and the problem was diagnosed as a fuel starvation issue. By the time the problem was fixed it was too late to return to the track. Gary still advised that the car had a small push so another adjustment was made and the Quaker State car started on the pole for the final 50 lap race. Gary immediately reported that the car was again too loose and he could not hold it down in the corners. By the time he was able to move into the top groove, he had dropped to eleventh place. The car was still loose and there was nothing to be done except to ride it out to the end. Both driver and crew were exhausted by the end of the day. Post race reflection revealed that it was perhaps too much to expect a top performance when the team had raced the night before, only gotten three hours sleep then, driven three hours to Kawartha and then have to work, or for Gary drive, in extremely hot and humid conditions. More valuable lessons learned for the future. With Saturday nights races rained out at Flamboro Speedway Gary and the team were looking forward to a good day at Delaware Speedway. Richard Holmes driver of the #42 Late Model at Flamboro was not taking his car to Delaware but joined the Quaker State team to help for the day. This would be a most fortunate event as his help in early pit work and car set up was instrumental in Gary pulling off another great time trial effort. Gary beat his July time by more than 1/10th of a second good enough to start 3rd in the Invader 100 lap qualifier race. After qualifying some minor chassis adjustments were made and used tires from the July race were put on for the first 100 lap race. When the green flag waved Gary held his line early and appeared to be competitive. After twenty laps of racing however all that changed. It became obvious that the team had missed the set up necessary for the long run. The car became looser and looser with every new lap. Finally Gary could not hang on any longer. Rather than take a chance on wrecking Gary headed to pit row and the tires were checked and some wedge was put in the car. Upon returning to the track Gary reported that the change helped but that it was not enough, the car was still too loose. The team huddled and examined the air pressures that were taken from the tires on the last pit stop. It was discovered that the right rear tire had increased by eight lbs. since the start of the race. Fortune smiled on the team as the caution was waived for an on track incident. Gary returned to the pits the pressure was reduced in the right rear and more wedge was put in the car. Gary restarted at the rear of the field. He immediately reported that the changes had helped and he began to move forward through the field. With about twenty laps remaining Gary reported that the car was loose again and he began to back slide. Gary did a remarkable job of holding on and brought the Quaker State car home in 12th place. Post race examination revealed that the tires were completely worn out. Lesson learned – don’t use old tires no matter how few laps are on them! The team again huddled and it was decided to make some significant changes to tighten up the car for the main event. The changes were made and the car was pushed to the starting grid in twenty fourth place. The field was set, the pre race festivities took place and then Gary strapped himself into the car. As the field exited turn four to take the green several of the lead cars crashed and the start was waived off. Again the race was started. There were two more wrecks in front of Gary in the first nine laps and by the time the carnage was sorted out Gary found himself in 16th place on the restart. When the green again waved Gary settled in and reported that the car was much better than the first race. Gary got into a rhythm and began to pass other cars. More cautions were waved for more crashes in front of Gary and he skillfully missed them all. By the mid race point Gary had moved into the top ten and all appeared set for a great finish when disaster again struck the Quaker State team. Exiting turn four in a line of traffic a part of the exhaust system broke off of a car and Jay Doerr in the 43 car ran over it causing him to spin into the outside wall. Doerr’s car then rebounded off the wall and across the track right into the Quaker State car. Gary reported that the electronics were dead and the rear end was broken. It was believed that the team’s day was over. The car was towed to the pits and upon inspection it was discovered that the damage was not as bad as it appeared. The team scrambled replacing the battery and the right rear trailing arm. A quick rear end alignment was made and the car was dropped to the ground. The situation was help by more on track incidents including a red flag period. As a result Gary returned to the track with out losing too many laps. Once back on the track Gary did a superb job of driving the car and he crossed the finish line at speed. If the team had ended the day at the crash it would have resulted in a 22nd place finish. By repairing the car and returning Gary to the track it allowed the team to finish sixteenth. Not the top ten that was hoped for but it at least ended the day on a happier note. Next Saturday night the team returns to action at Flamboro Speedway. With only three races left at Flamboro Gary is within five points of fourth place and still has a mathematical shot at third. If nothing else the team has learned to never give up this season. Who would have thought after the first month of the season when the team was mired in 15th place that they would be at this point now. Your Chance To Be In Film! 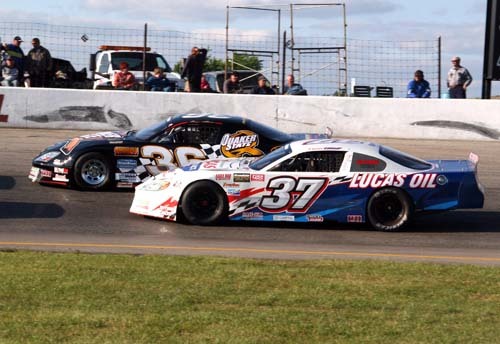 Legacy Films Canada Inc. and Producer/Director Andrew E. Stewart and the cast and crew of his original television series “Cotter Pins” will be on location at Lucas Oil Flamboro Speedway over the next few weekends. They will be shooting racing sequences, action in the pits as well as some scenes in the control tower and the viewing stands. The production will then move to Oshawa Ontario for additional shooting of street racing and nightclub scenes. The stars of this dynamic new TV series, signed to date, are Benjamin Rouse (Stephen King’s “Rainy Season”, “Relic Hunter”, “The Guiding Light”), John “Stony” Stoneham Sr. (the Lonestar Cowboy, the Lonestar Network, USA), Tina Shaw (Toronto Sun Bikini model of the year 2006 Second City Alumni), Julia Hazelton (Relic Hunter), Kelly Hoare (Oshawa Little Theatre, Second City Alumni) with additional cast to be confirmed shortly. 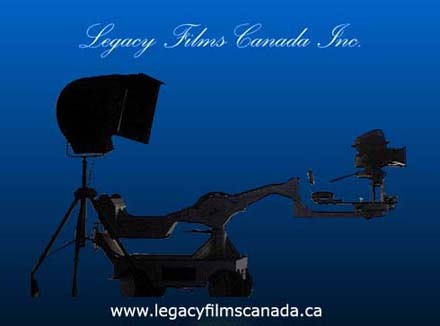 They are actively seeking interested sponsors for this production to assist with associated costs as they are not financing this film through any traditional Canadian funding agencies. 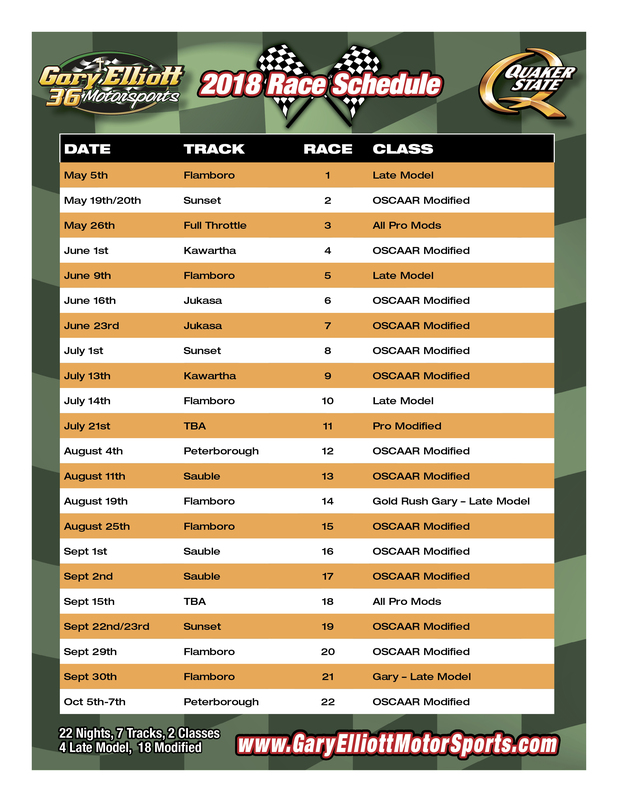 Lets get the largest crowd in years to fill the stands for the racing sequences. Come on out and bring all of your friends. This promises to be a lot of fun and who knows it might be your big chance to be on film. You will also be present to see some great racing at the same time. The production is looking for race cars, teams, locations for additional filming and many extras to fill the grandstands and pits. Interested persons are requested to contact Elliot Prentice at prentice@mycybernet.net for further details and registration for race cars, sponsors, locations, actors and background. The team had a lot of work to do during the week. The rear body parts were removed, repaired and painted. The track bar mount was repaired. Weight ballast was added, the car was scaled and the chassis was adjusted for the up coming race at Flamboro. On Saturday night the car was fast in warm-ups and some minor adjustments were made to make it even better. Gary advised the team that he felt a vibration. The car was checked over and all appeared ok. Gary started 7th in his first Heat race and made some good moves to pick off three positions to finish 4th. Some more small adjustments were made and Gary started on the outside pole for his second Heat race. Gary pulled on the track and immediately reported that the vibration was really bad and that he was sure it was the transmission. There was nothing to be done except start the race and hope for the best. The green flew and Gary rocketed into turn one and took the lead. He began to pull away from the field. After three laps the car began to slow ever so slightly. 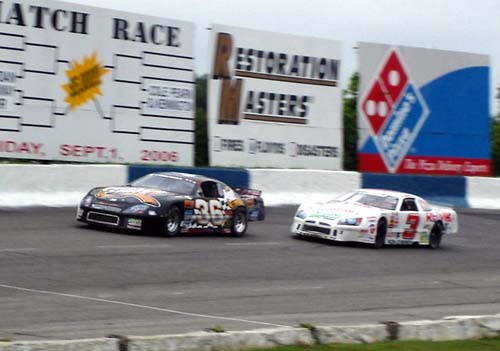 By this point Jeff Stewart in the 56 car had cleared traffic and moved into 2nd place. Lap after lap he closed the distance and by lap seven he was on the rear bumper of the Quaker State car. Gary reported that the vibration was now a very bad grinding noise and he was sure the transmission was about to fail. With three laps to go the team crossed their fingers and hoped for the best. On each of the closing laps Gary would out pull Stewart exiting the corners but Jeff would close up down the straits. As Gary exited turn four on the last lap he held his breath hoping the transmission would hold together. It did just barely and Gary crossed the finish line to take his sixth win of the season. The team worked feverishly in the pits to change the transmission, make some more chassis changes and gas the car for the Feature. Gary started 5th in the Feature and maintained that position as the field sorted out to single file racing. At mid race David was running in front of Gary and the top six cars were all nose to tail. Gary reported that the car was very good. It now became a game of cat and mouse to see if anyone in front would make a slip. As the laps counted down David’s car became loose and he was having more and more trouble holding it to the bottom groove. As David entered turns three and four on the final lap his car slipped high and Gary pounced. He drove deeper into the corner with his left wheels on the apron. The tires stuck and Gary accelerated off the corner and passed David to take 4th place at the checkered. With the 4th place finish Gary moved one point ahead of Simon Wild for 4th place in the standings with one race left. The crew will work extra hard this week to prepare the car for next Saturdays final points race at Flamboro. It promises to be a thriller that no one should miss. Gary talking to a fan. Gary and Big Jim had a great time at the car display. Gary autographed more Hero Cards than every before. He felt that it helped strenghten his grip for the race later that night (lol). Just moments after Gary pulled into the pits at the conclusion of the Feature race Jason discovered the right front tire had gone flat. Inspection revealed a rivet had punctured the tire and it had stayed lodged in the tire keeping the air in just long enough to complete the race. Note the tire rub mark on the front valance and the blue paint on the flat tire. Both are a result of the contact with David on the opening lap. PS. The rivet was blue too! I wonder where it came from? David explains to Gary how close they had come to wrecking on the opening lap. Both father and son had a good laugh about the incident and celebrated David’s Championship and Gary’s 4th place points finish. 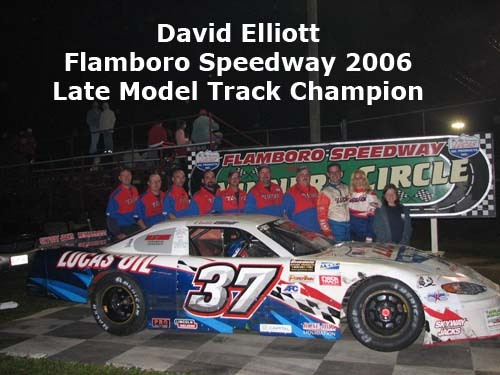 When the checkered flag fell at Lucas Oil Flamboro Speedway on September 16th, David Elliott added another Championship to his resume – his first Track Championship in a Late Model. David captured 11 Heat wins and one Feature victory during the year, but it was consistency that was the key to winning this title. 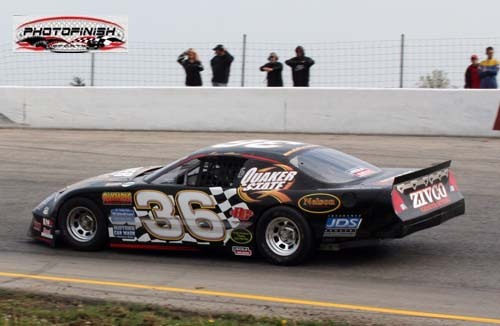 His average finishing position at Flamboro Speedway was an impressive 4th. In fact, during the 18-race season, the Lucas Oil Chevrolet finished in the top-5 an amazing 16 times. How did David and his crew handle the race day pressures of Championship day? “Well we went go kart racing in the morning.” said David. David rewarded Crew Chief Eddie Askins and crew member Marty Hagen for their dedication and hard work by giving them each a trip to the Dominican Republic. 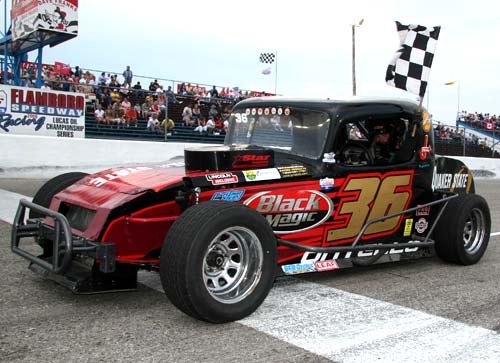 David becomes only the fourth driver to win titles in both the Canadian Vintage Modified and Late Model divisions. 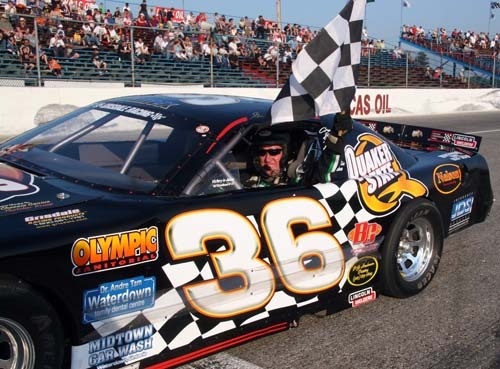 David began the 2006 season with two goals – win the Late Model Championship at Flamboro Speedway and capture the overall Weekend Warrior Series title. He’s achieved half of his goal and is leading the Weekend Warrior Series point’s standings with three weeks of racing left in the season. 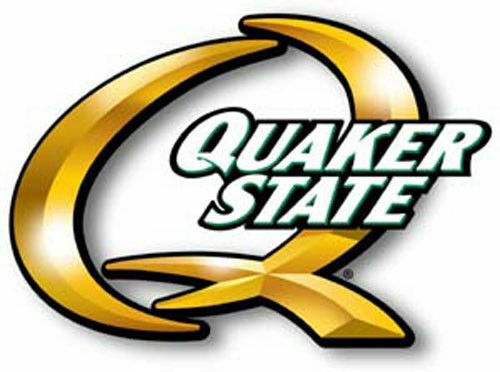 The entire Quaker State Team wishes to congratulate David and his crew on their Championship. We would also like to let them know that they only get to celebrate for one year because we intend to beat them next year! Saturday promised to be a long and possibly stressful day. David was set to win his first Flamboro Championship in a Late Model and the Quaker State team was one point ahead of # 06 Simon Wild for 4th place in the Flamboro points. Considering the many things that had gone wrong during the 2006 season no one would have been surprised if Gary and his team had arrived at the track all nervous and up tight. Just the opposite was what occurred. During the week the team had worked hard on the car checking every nut, bolt and system and then rechecking them to make sure all was in order. Early Saturday morning Big Jim and Gary took the Quaker State #36 for showing and autograph session. All went smoothly and Gary was in his element talking with fans and signing autographs. When the team arrived at the track the car breezed thru pre tech and was made ready for warm-ups. The car was very fast in warm-ups and only minor adjustments were made prior to his first Heat race. Gary started on the outside pole in the 2nd Heat. He was informed by radio that David had just won the 1st Heat so he took to the track with a strong desire to put both Elliott cars in victory circle early. To say that Gary dominated would be an understatement. When the green flag fell Gary drove deeper into turn one than ever before and took the lead from pole sitter Jeff Lotspeich. Gary rocketed out of turn two, down the back straight and pulled out to a two car length lead. For the entire ten lap distance of the race Gary hit all his marks with precision and turned the fastest times of the day by any car at the track. Gary took the checkered flag for his seventh win of the season before the 2nd place finisher was even exiting turn four. Some more minor chassis adjustments were made prior to Gary’s second Heat race. 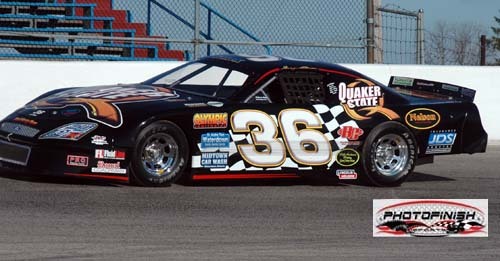 This one would not be as easy with the Quaker State car starting in seventh place. 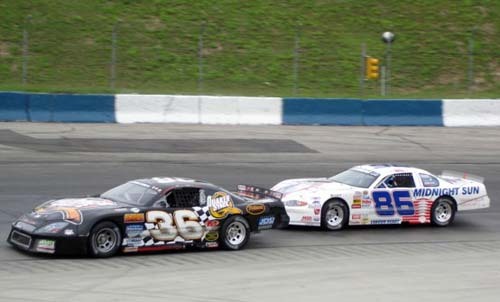 As the green flag waived Gary became embroiled in a great side by side battle with # 50 Dave Baker. The two had raced each other hard all year and each driver held great respect for the other. For two laps the pair were side by side when Gary finally got the advantage exiting turn two. Gary managed to pick off two more positions in the final laps and finished in 4th place. David had finished in 6th place in his 2nd Heat race and only needed to finish the Feature and pass technical inspection to win the Championship. For Gary’s part the 1st and 4th place Heat finishes gave the Quaker State team a five point lead over Simon Wild to start the Feature. Gary proclaimed that the car was perfect. For probably the 1st time in two years no adjustments were made to the car prior to the Feature. Gary was slated to start 5th with David starting 4th. Simon Wild was slated to start 10th. When the green flag waived the field entered turn one very tightly bunched. As they exited turn two David’s car became loose and when he corrected his slide he came down across the nose of the Quaker State car. The two made contact. Gary checked up and turned to his left. His lightning fast reflexes saved the day and both drivers were able to straiten out and pick up the throttle without losing a spot. David settled in front of Gary and the two set off after the leader. 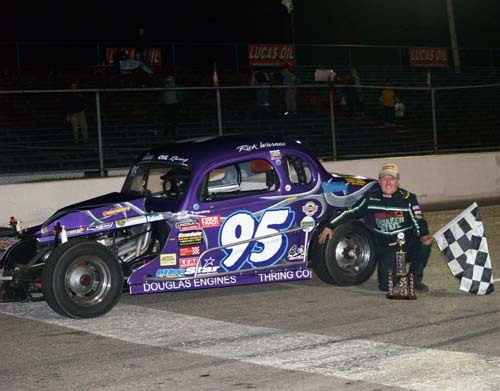 By lap seven the pole sitter Richard Holmes was pushing up in the corners and Steve Laking driving the #56 Kubota Car drove below him to take the lead. David then pressured Holmes and took 2nd place. After a brief caution period Gary settled behind Holmes and waited for him to again start to push. A few laps later the opportunity arose and Gary drove below Holmes and took 3rd place exiting turn four. Gary rapidly caught the leaders and settled onto David’s rear bumper. As the laps counted down David’s car appeared to become loose and Gary contemplated attempting to make a pass. Gary looked low over the closing laps but David was able to keep his car down low enough on the track so that no clear opportunity to pass presented it self. Steve Laking took the win. David took 2nd and his 1st Late Model Championship. 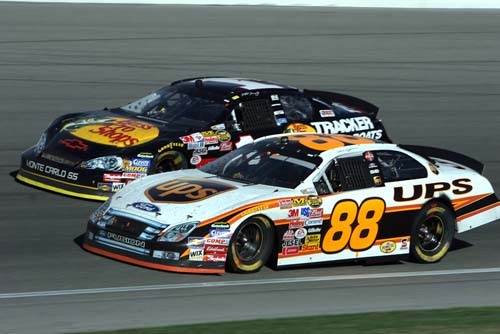 Gary finished 3rd and captured 4th place in the point’s one position better than his rookie year. Gary’s seven wins for 2006 was also one more than his rookie year. The team was very pleased with those accomplishments considering the horrendous start to the season and the trials they had overcome to finish 4th. Gary was also pleased with his teams finish, but nothing could compare with a father’s immense pride and joy at David’s Championship win. This coming Saturday the Late Models are off and Gary plans to drive his Vintage Modified at Flamboro in the Open Wheel Extravaganza. 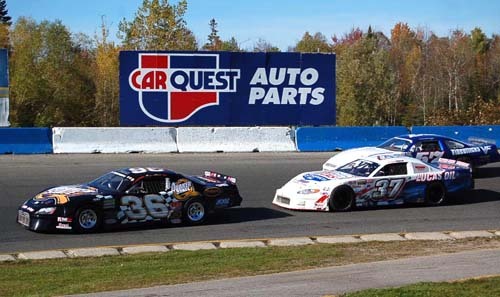 Twenty five Late Models took to the track on Sunday to attempt to qualify for the Oktoberfest 100 to be run on October 14. The Quaker State car was a little loose in warm-ups so some adjustments were made to tighten it up for the Heat races. Drivers drew for their starting positions for the Heat races and Gary’s draw set him to start 4th in the third Heat. The #4 car of Craig Zurbrigg was slated to start 2nd but his car was damaged during warm-ups and was not up to speed so he started at the rear of the field. This moved Gary into the 3rd place starting position. At the drop of the green flag Gary followed pole sitter Roy Wilkie into turn one. Jim Molenhuis started 2nd and dropped back beside Gary in the first turn. The two raced side by side out of turn two and down the back straight. Gary drove deeper into turn three and exited turn four ahead of Molenhuis and right on Wilkie’s rear bumper. For eight laps Gary tried every move he knew to attempt to pass Wilkie who was mirror driving and blocking every inch of the track. 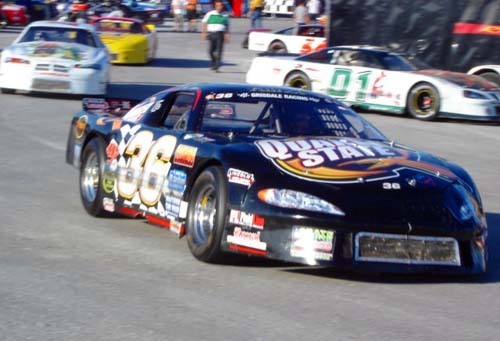 On several occasions Gary was below Wilkie entering the turns and he would cut down on the Quaker State Car. Gary wisely backed out in time to avoid collision, figuring it was better to finish 2nd than wreck and not finish at all. Only one minor adjustment was made to the car prior to Gary’s second Heat race. The Quaker State car lined up in 5th for the start and Gary knew he would have a tougher race this time. As the field entered the 1st turn Gary followed the #41 car of Steve Adams through the low groove and past one car in the corner. As he exited turn two Gary got a great run and attempted to move below Adams. As they raced down the back straight it became obvious that Gary was running out of room so he backed out and again settled in behind Adams. A few more turns around the track and one more position gained. Suddenly Adams pushed up exiting turn two and Gary wasted no time in diving low to take third place. Gary then set his sights on the 2nd place car of Anthony Simone. Gary ran him down in short order and attempted to pass him on the outside. For three laps Gary appeared to gain a little momentum on the outside only to loose it exiting the turns. On the last lap Gary made one last valiant effort to make a pass by entering turn three high and then diving low and attempted to drive under Simone exiting turn four. The move almost worked and Gary crossed the finish line only a couple of feet behind Simone. Gary and the Quaker State team were pleased with the results of the qualifying and are looking forward to starting 5th for the Oktoberfest 100 on October 14. With Late Model qualifying complete Gary then moved across the pit area for his ride in the #95 CVM car of Rick Warnes for the Clash of 2006. 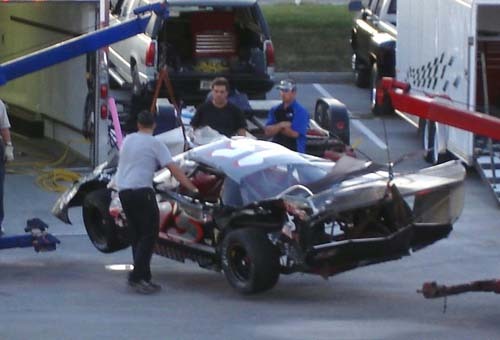 Last year Peterborough was the site of the worst Late Model crash in which Gary has been involved. Gary’s car became airborne, as it left the track after he attempted to avoid another competitor, and then struck a pile of tractor tires causing considerable damage. Gary was not seriously injured but he was plenty sore for a few weeks. The team worked hard to repair the car but it was not competitive for the next days Feature. If the thought of returning to Peterborough Speedway was not unsettling to Gary it definitely was to some of his team mates and friends. During Saturday mornings practice the car appeared close on set up. Jason was filling in as Crew Chief and after consultation with Gary some minor changes were made to the set up. Gary started 8th in his first Heat. During the race Gary discovered that the car was still a little tight. Despite this condition Gary drove aggressively and passed three cars to finish 5th. The Quaker State car had the pole for the second Heat. Jason and Gary made some additional changes to the chassis to attempt to loosen the car up. At the drop of the green flag Gary drove deep into turn one and took the lead. Much to Gary’s frustration the car was still too tight. It mattered not as Gary drove the wheels off the car and held the lead for the entire race and took the win. Congratulations were due all around for Gary’s first win away from Flamboro, Jason’s first win as a Crew Chief and the car was still in one piece. A definite improvement over last year. Gary was the 7th fastest qualifier on Saturday and thought that would be where he would start the Feature. When the starting line up was posted the team learned that an inversion system similar to Flamboro was in effect and that Gary would start on the pole. Prior to the Feature race some more adjustments were made to the car in an attempt to loosen it up. After making these adjustments the team’s main concern was that perhaps they maybe had gone too far. No one was worried that the car would be too tight. At the drop of the green flag Gary again got a terrific run and beat the outside pole sitter into turn one. Gary drove deep into the turn and to the team’s utter disbelief the car pushed up horribly in the turn. Gary compensated for the push and he retained the lead down the back straight, through turns three and four and along the front straight. As the Quaker State car entered turn one on the second lap it again pushed up. This time David, who was running 2nd, drove below his Dad and took the lead. Gary continued to correct for the push and dialled in more rear brake in an attempt to compensate. The crew began to discuss what to do. It was decided to have Gary come to the pits during a caution so that some changes could be made to the cars setup. Gary was making some headway on the track and had settled into 8th place when a caution came out for a spin. Gary dove into the pits and the changes were made. Gary radioed asking for someone to look at the right front tire as he had begun to suspect that perhaps it was losing air. This transmission was not received by the crew and Gary returned to the track. When the race was restarted Gary could hardly get the car to turn and almost wrecked in turn three. The next lap Gary entered the pits under green. The right front tire was indeed very soft and a tire change was made. Gary returned to the track four laps down from the leaders. To make matters worst the changes that had been made to the chassis under the first pit stop had now made the car too loose. Gary drove his heart out and managed to pick up a couple of positions to finish 14th. This was not the desired result but Gary and the team were very happy to be taking the car home in one piece. Post race inspection revealed a cut in the tire that had been on the right front. The general belief was that the Quaker State car had run over a sharp object either in the pits or during pre race warm-up on the track and that it had a very slow leak and this was the reason for the push. The team took solace in the idea that the pre race set up was probably good and maybe they could have won if not for the flat tire. David finished 3rd in the Feature and clinched the Weekend Warrior Championship. Congratulations to David and his Crew on a remarkable year. The age old saying “You can never go back” got a real mortal wound on Sunday night. Thanks to the gracious offer by Owner/Driver Rick Warnes of the 95 car Gary was able to compete in the Canadian Vintage Modified Clash of 2006. The clash is the CVM’s All Star race for Feature winners from the preceding year plus any past CVM Champions. The Clash of 2006 was divided into two 15 lap races with a complete field inversion from the finishing order from the first race. Gary started at the rear of the field for the first race as he was unfamiliar with the car. During the race Gary felt out the handling and dealt with a bad pushing condition. Gary finished third from the last in the first segment. 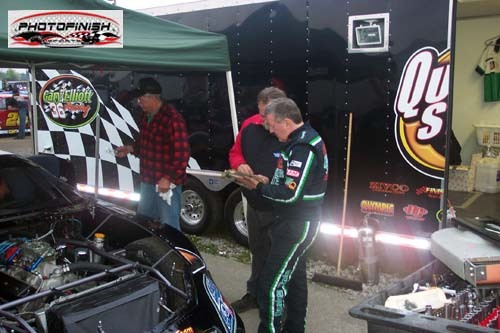 Rick Warnes’ team made major chassis adjustments prior to the second race. Ray Hughes and David Elliott both finished behind Gary in the first segment and were also driving borrowed cars. Ray dropped out and David was still not confident of his cars set up so he opted to start at the rear of the field. This left Gary on the pole for the second race. At the drop of the green Gary raced side by side with Brian Atkinson into turn one. Gary took the lead exiting turn two and then did a masterful job of holding it for the entire race despite many hard attempts by Atkinson to take the lead. Lap after lap Atkinson would close on Gary’s bumper at the end of the straights and look to dive low under Gary. He was never able to complete the pass as Gary using all of his experience held his foot off the throttle until just the right moment so that he could get the best run out of the corner. Gary crossed the line to take the checkered much to the delight of his fans. I am not sure if Gary is the only driver to win both a Late Model and CVM race in the same season but if not then the list is very short and he should be proud of this accomplishment. Phil Shaw won the over all Clash with 1st and 4th place finishes in the two events. 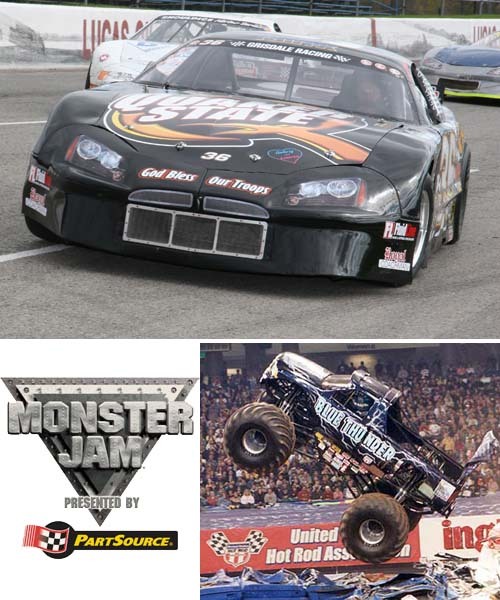 Hamilton is about to be invaded with MONSTER TRUCKS at the first Monster Jam presented by PartSource!!! Friday November 17th at 8pm and Saturday November 18th at 8pm at Copps Colliseum will be the home of legendary Monster Trucks: GRAVE DIGGER ®, AFTER SHOCK ®, BLUE THUNDER ®, AMERICAN GUARDIAN ® and ANGER MANAGEMENT ®. Good seats still available. Come into any PartSource Store in the Greater Hamilton Area for your “MONSTER CASH” coupon for $5 off any Extreme adult seat. Available exclusively at PartSource. 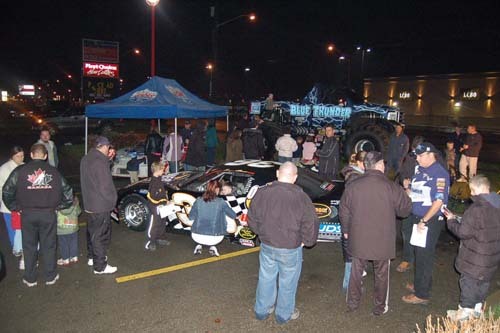 Gary’s Quaker State Dodge, David Elliott’s Championship car and Monster Truck BLUE THUNDER ® will be on display at the PartSource store at 106 Centennial Pkwy N. Hamilton on Thursday November 16, 2006 from 4:00pm to 8:00pm. Gary will be in attendance to sign autographs and talk to the fans. Elliott Racing Team vs Blue Thunder! Monster Truck vs. Late Models. Which is more popular? It was billed as the greatest competition ever! The mighty Monster Truck “Blue Thunder” vs. Gary and David’s Late Models. 1,600 methanol burning, supercharged horsepower of Blue Thunder vs. the two 400 horsepower Elliott racing team engines. The scene of the showdown – PartSource parking lot Stoney Creek. Gary and the team arrived at the lot early so that they would have plenty of time to set up and prepare for the evenings events. Upon their arrival and much to their surprise the “Blue Thunder” team was already on site and had their truck unloaded. The few people on site were milling around the truck. The driver then climbed into Blue Thunder and started the engine. The roar was ear splitting! The ground shook and you could feel the air vibrate. The truck lurched forward and popped a wheelie much to the delight of the onlookers. Gary looked at me and stated “How do I compete with that? My engine is going to sound like a lawnmower in comparison.” Blue Thunder then drove to its display area and the engine was shut down. My ears were still ringing 15 minutes later! The team then set about removing the Quaker State Dodge from the trailer. This process was not as simple as it sounds due to the fact that the winch was in the shop being repaired. After several aborted attempts at removing the car the driver and crew chief from Blue Thunder came over and lent a hand in getting the car out of the trailer. Gary then slid behind the wheel and primed the oil pump. He then pushed the starter and the engine fired to life, sputtered, back fired and then died. You could see the look of disappointment on everyone’s face. After several more attempts the engine finally roared to life and settled into its normal deep rumble. A fan standing beside me asked “When is he going to start the engine?” It was obvious that this fan’s ears were still ringing from the Blue Thunder run. Round One: to “Blue Thunder”! Gary moved the Quaker State car into its show place and shut the engine down. A short while later David’s team arrived and set up their car. Now it was two against one and we began to feel a little bit better about our chances. Before any of the teams could complete the set up of their display the fans started to arrive in surprising numbers. At first they all started to congregate around the Monster Truck. Slowly but surely they began to trickle towards the Late Models. One family with several small children walked up to the Quaker State Dodge. Gary looked at the parents and asked if they would like to sit in the car. The children’s faces lit up with joy. The parents consented and one at a time Gary helped them climb into his driver’s seat. The children let out cheers of joy and the parents took their pictures. Gary then signed his autograph cards and gave one to each of the children. As they were leaving the parents thanked Gary for his kindness. Suddenly a torrent of fans appeared around the Quaker State car each wanting a chance to sit in the car. Gary was kept very busy for the remainder of the evening signing autographs and helping fans into his car. David’s team also let fans sit in their car and were kept equally busy. Round Two: Elliott Racing Team. The evening was very mild with above average temperature. Although it threatened rain none fell. A larger than expected crowd of fans continued to arrive all evening. The drivers and Team members were keep busy answering questions, posing for pictures and signing autographs. At several points during the evening the Teams took turns firing up their engines. Each time this occurred the fans were staggered with shock and delight at the awesome sound from Blue Thunder. Once the engines were shut down however the crowds would again line up for their chance to sit in a Late Model. The Elliott Racing Team had a great night meeting and making new fans of Stock Car racing. The Blue Thunder Team had an equally good time as did the PartSource management and employees. It was a highly successful night for everyone involved. By the end of the show both the Elliott Racing Team and the Blue Thunder Team agreed to call the competition for “The Most Popular” a tie. The Elliott family and racing team would like to wish everyone a very Merry Christmas and Happy New Year. 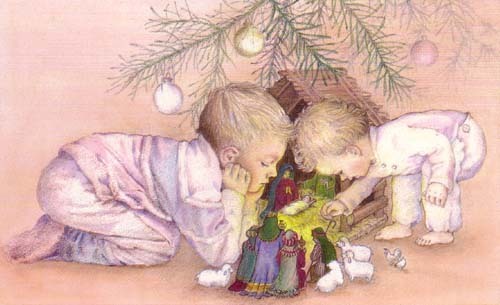 We hope that everyone has a safe and happy holiday season.